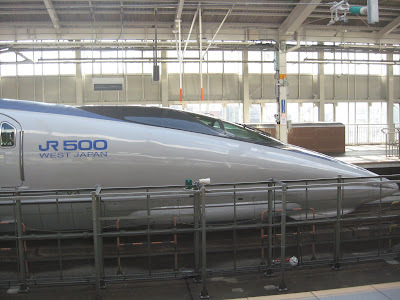 I spent a week traveling in Japan, using my Japan Rail Pass and traveling on the bullet trains, which travel at up to 186 mph! As a kid I loved reading the Laura Ingalls Wilder books, and I remember that Laura, accustomed to wagon travel, rode on a train for the first time in the 1880s. Although that train must have gone very slowly by today's standards, she wrote that the speed was so fast that she could not take in her surroundings as she sped by. I felt that way on the bullet train! And imagine how nice it would be to have a bullet train going up and down the front range of Colorado, along I-25. I visited Hiroshima, where the U.S. dropped the atomic bomb in 1945. The entire city was demolished within seconds or minutes, and somewhere near 200,000 people died. Some of the radiation victims are still living. Many others died of leukemia or other cancers. Today, under the epicenter of the A-bomb there is a peace memorial museum, and memorials to the children who died and to the Korean and Chinese forced laborers who died there, and there is a flame that will burn until the last nuclear weapon is eliminated from the world. The U.S. is one of the countries that continues to have nuclear weapons, and it seems that there is no end in sight. I rented a bicycle, a very pleasant way to see Hiroshima, and stayed at a really cute hostel in a room with three young Japanese-American women who were traveling together. One of the women is working on a Japanese farm, under a trainee visa which means that she is supposed to be in Japan in order to learn Japanese farming techniques. Instead, she has been made to work from 2 a.m. until 8 p.m. six days per week for only U.S. $700 per month (worth less in Japan than in the U.S.) and she is doing hard labor, not receiving any training. Most of the other workers are from Indonesia and the Philippines, and are treated worse. The farm confiscates their passports and holds all of their pay, refusing to even let them send money home to their families. When the young Japanese-American woman questioned these condition,s her employer denied her access to the telephone and limited her access to food. Eventually, the woman changed her placement to a different farm (the first farm shorted her pay) and the first farm hired a Philippina woman in her place, saying that a Philippino would be able to take the conditions (meaning that the Philippines is so poor that workers from there will not dare complain or quit). It is disheartening to see that the same schemes and techniques are used world-wide to abuse farm laborers. Traveling alone in Japan, without Itsumi, I had to deal with restaurant menus for the first time. At many restaurants, everything was written in Japanese characters. The only thing I could read was the numbers, unless they too were written in Chinese characters as is the case sometimes! In Hiroshima I had lunch at a soba restaurant that served soba, or buckwheat noodle soup. Unable to read the menu, I asked the waitress for soba. She gestured that everything on the menu was soba. So I chose a price from the menu and pointed at it, hoping it would be something I like! The waitress brought me a delicious bowl of egg drop soba. Outside of Hiroshima I visited Miyajima, the site of the famous "floating" torii or gate to the shrine. Miyajima is an island, which I got to by ferry, and it's populated by some very friendly deer who like to dig into the pockets of tourists! In Miyajima I did a beautiful hike to a mountain top, among beautiful fall leaves. At the top of the mountain I took pictures of wild monkeys, and then took the cable car down. I am really appreciating the fall leaves this year! My fall started in September in Minnesota, and is still going in Japan!